1. What comparison does Apollo make of his own and Rocky’s styles of fighting? 2. What do the Balboas give to Paulie for his birthday? 3. Rocky gives Adrian a watch for their anniversary. How long have they been married? 4. Rocky now drives a black Lamborghini. What does the license plate say? 5. What is Ivan Drago wearing when he appears for his first press conference in the U.S.? Drago is a Captain in the Russian army. 6. According to the press, what is Drago's nickname? 8. Drago's strength is measured in front of the press. How many pounds per square inch of pressure do Drago's punches pack? Drago's handler says a normal heavyweight's average punch measures 700 pounds per square inch. 9. How does Drago's wife explain her husband's "freakish strength"? 10. Rocky tries to discourage Apollo from fighting Drago. How does Apollo explain his motivation? 11. Name that tune: What song is performed live at the arena as both Drago and Apollo enter? Singer James Brown is listed in the credits as "The Godfather of Soul"
12. How many rounds does Apollo's fight with Drago last? 13. How is Adrian informed of Rocky's decision to fight Drago? 14. How does Rocky explain his motivation to Adrian despite her concerns that fighting Drago is suicide? 15. What will Rocky be paid for the bout against Drago? Nothing. It's not about the money. 16. Why will the upcoming fight between Rocky and Drago be held in the Russia? Drago would be arrested for Apollo's death in the U.S.
17. On what holiday does Rocky fight Drago? 18. While Drago trains in a lab, Rocky trains out in the cold. Which of these is not shown as part of his training? 19. Late in the movie Drago announces his own motivation for fighting. What is it? "I fight for Mother Russia." "I fight for the party." 20. What does Drago say to Rocky when they meet in the ring? "You will die like Apollo." "In Soviet Russia, stallion rides you." Yakov Smirnoff would have made this movie 10% better. 22. How many rounds does Rocky's fight against Drago last? The only time Drago goes down is when he is knocked out in the fifteenth round. 24. 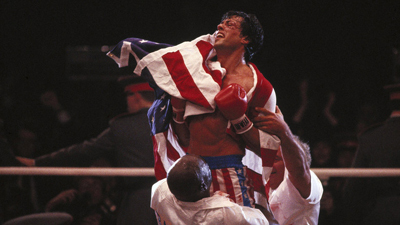 By the end of the fight, the Russian crowd is chanting "Rocky" instead of "Drago." What do the announcers credit for this shift? 25. What real-life event happened as a result of this movie? The two were married a month after Rocky IV was released, and they costarred in the movie Cobra the following year.